Enhancement: Telepathically induce extreme vertigo/ dizziness/ motion sickness in others. Anne Richards is the Strike Team Management Cell (STMC) Chief. Richards works out of Washington DC and is operationally responsible for all AOE strike teams in the US. 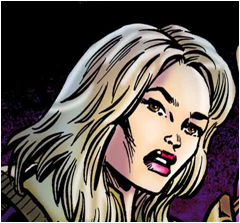 She was originally a member of Strike Team 1, but resigned after her near-death experience during a major operation. She was asked by NEXIS and the DOJ to become the STMC chief upon the creation of additional strike teams. Her enhancement allows her to bend/twist a targets perception making them dizzy to the point of losing balance or throwing up.